Canada's first space clown can brag that his recent trip into the cosmos generated at least 23 times more international news coverage this year than the Canadian mission in Afghanistan. Canada's first space clown can brag that his recent trip to the cosmos generated at least 23 times more international news coverage this year than the country's mission in Afghanistan. The figure comes from a media research group hired by Guy Laliberté, the Cirque du Soleil founder who recently became Canada's first space tourist. The Quebec billionaire hired Montreal-based Influence Communication to look at 71 countries' radio, TV, newspaper and internet coverage of his cosmic voyage. The firm's analysis says it would have cost $592.4 million to buy that much advertising for Laliberté and his environmental foundation. The Cirque founder shelled out $35 million US for his extraterrestrial flight, suggesting a rather nifty return on investment of more than 1,500 per cent. 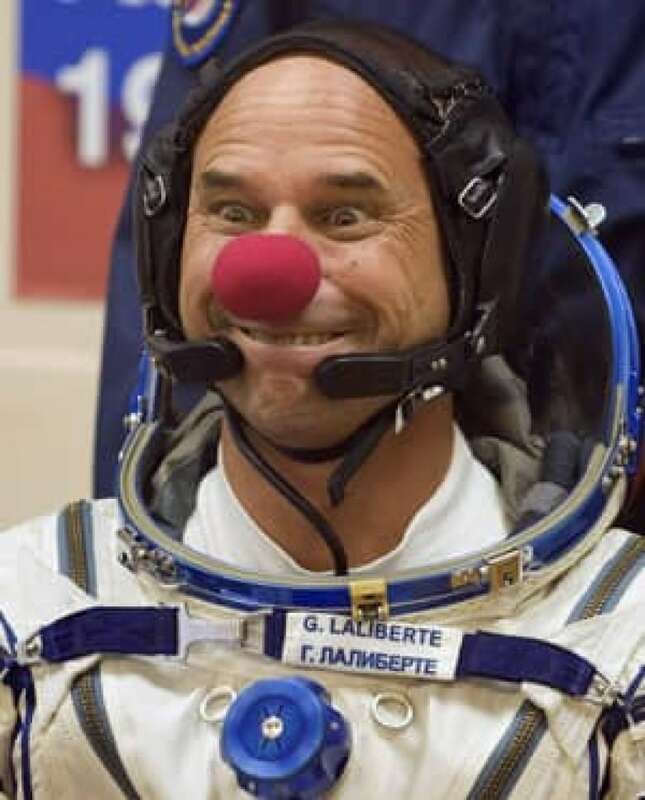 Laliberté blasted off from the Baikonur Cosmodrome in Kazakhstan on Sept. 30 and spent 11 days in a spacecraft and aboard the International Space Station. Jean Lambert, a senior analyst at Influence, said his firm began its tracking on June 4, the day Laliberté held a news conference to officially announce his trip. Through mid-October, it counted nearly 41,000 reports about Laliberté and his One Drop environmental foundation. The firm estimated the play on newspaper pages, airwaves, and websites would be worth half a billion advertising dollars. By way of comparison, Canada's mission in Afghanistan — the most significant and gruelling international undertaking by the country since the Korean War — showed up in 1,812 news items over the entire year, from January to mid-October, Influence Communication asserted. "[It's] not to belittle the importance in international media of Canada's presence in Afghanistan," Lambert said. "But this got 23 times more space or time coverage in the media than Canada's presence in Afghanistan." Karl Moore, a McGill University management professor, compared Laliberté to another billionaire, the "flamboyant" Richard Branson, founder of Virgin records, "one of the great marketers in the world." "This is a guy who knows, thanks to his Cirque du Soleil experience, how to get that kind of coverage and make the most of it," Moore said in an interview. "Maybe the numbers are overstated a bit, but I think that there is actually a fair bit of reality to them." Moore suggested Laliberté's story got even more coverage thanks to his red clown's nose, which he used as a colourful photographic prop. The media tended to pick up Laliberté, Moore said, because "it gives us a bit of relief from the sheer seriousness of our daily lives." From outer space, the Cirque founder conducted a series of events around the world designed, he said, to raise awareness about protecting water. The Cirque's public relations director said most of the Canadian coverage of Laliberté's trip was positive. "We did get some criticism, but it was mainly from editorialists," Renée-Claude Ménard said. "It wasn't enough to discourage us. It was a little bit disappointing but, at the same time, we have to look at the global coverage and look at it in a positive sense." Laliberté was surprised by the volume of international coverage, Ménard said. Six tourists had been to space before him, she said, and none drew close to that much attention. Ménard said her 50-year-old boss hasn't ruled out another extraterrestrial voyage in the future because his last one wasn't long enough. "I was there when he got off the bus after returning on the Soyuz shuttle, and it was really funny. He said, 'I would have stayed at least two more weeks.' "
She said she wouldn't be surprised if Laliberté decided to make another space trip if the opportunity presented itself.